Using SPLAT II, researchers generate mass spectra and then analyze them to identify the morphology of different particle types. 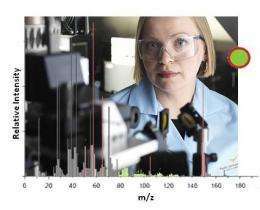 (PhysOrg.com) -- Two very different forms of climate-influencing particles do not behave as expected, according to scientists at Pacific Northwest National Laboratory and Imre Consulting. The team's measurements show that when the particles mix, they create new, layered particles, not the expected mixtures. The team also found that one form adsorbs onto the other, creating bigger particles that do not behave as predicted in climate models. This study led to an invited paper in a special issue of Proceedings of the National Academy of Science. Whether created by nature or humankind, tiny particles in the atmosphere influence the planet's climate. In particular, scientists are concerned with primary and secondary organic aerosols. Abundant in the atmosphere, these particles are derived from fossil fuels and other sources. Scientists aim to model the effect of these particles and other factors to predict the effect of various remediation strategies on climate. Studies like this one are essential to understand the processes that determine the numbers and properties of particles, leading to more accurate models and predictions. The team generated three different types of particles inside large reaction chambers and analyzed the particles using SPLAT II, a single particle mass spectrometer, located in DOE's EMSL, a national scientific user facility at PNNL. Using the depth-profiling method, the researchers obtained data about the morphology of all three-particle types. First, the team created SOAs formed in the presence of particles composed of hydrophobic (or water-fearing) dioctyl phthalate (DOP), a proxy for exhaust particles. The team found that the SOA material forms a coat on top of the DOP particles. When the team looked closely at these particles, they found that the final particles obtained two coatings: a DOP core was coated with a thick SOA layer that was coated with a very thin DOP layer. Next, they created particles by making pure SOA and coating them with DOP. They found these particles had a stable DOP coat on top of an SOA core. Finally, they generated SOA particles in the presence of DOP vapor and to their surprise, found the newly formed SOA particles to be coated with a layer of DOP that is about 4 nm thick, and increases the particle mass by 12%. The team was honored to be invited to contribute a paper on these results to the Proceedings of the National Academy of Sciences, said Dr. Alla Zelenyuk, the principal investigator on this study and a chemist at Pacific Northwest National Laboratory. The paper will appear in a special issue on atmospheric science. The scientists are continuing their research into measuring the effect of the hydrophobic coating on secondary organic aerosols. There IS a lot we don't know yet about the climate, and how mankind is affecting it. This article is yet another discoveries that could have big impacts on climate models. But there is a lot we do know. The job of climate deniers is to fan the flames of doubt, and ignore the settled science. I sadly expect this article will be yet another tool in the hands of the deniers. We need to keep plugging the holes in our knowledge with solid science like this, while acknowledging those areas where we have quite good understanding. Climate models make assumptions which, as shown here, are sometimes unproven. The problem is not with the climate skeptics, it's with the scientists who are not informing the general public about the assumptions that go into those models, making the edicts of the IPCC sound much more authoritative than is warranted. Also, I take issue with the phrase "settled science". Science, by its very nature, is never settled. If you stop asking questions, if you stop formulating new hypotheses and testing them, you will never find out the truth. Real scientists welcome challenges and new theories as well as new data. Only the easily led, and those who crave "certainty" can't handle these truths - that's why religions flourish. Let's drag the climate debate back to the scientific arena and stop using the phrase "settled science" as if there was nothing left to discover. Climate science is not a 'hard' science, dealing as it does with a system as open as the Earth. Settled? Since we also don't understand the exact mechanism by which smoking is linked to lung cancer, we shouldn't make that link either, right toyo? Qualifiable data vs. quantifiable data. This type of study is bridging the difference between the two. Of course, if you don't understand the difference between qualifiable and quantifiable, then perhaps these kinds of discussions are far too difficult for you. Toyo: Your comment about: "the scientists who are not informing the general public about the assumptions that go into those models." If you check the literature the assumptions, algorithms, and references are all included. The problem is that the internals of a computer program are something the public is not interested in nor, generally, understand. The basis for the codes has been available for years. The software (as any complex software) is continually being improved (how many recent updates have you received for your operating system?). I have never seen any researcher claim their software was "finished." And, I have seldom seen anyone not disclose the basis for their algorithms. However, I have seen almost anyone who is sane refuse access to their raw code. If someone wants to build their own, then go to the papers and write your own based on what is there. Most can't, or won't, do that. There is no 'settled' environmental science--yet. Just wanted to make that clarification. As to the above study, I find it quite fascinating. I hope that further work is done and the models can thereby be modified into something more workable than hitherto. Let's see - Jayk immediately jumps in with his provocative 'holier than thou' attitude - and succeeds in nothing more than muddying the waters as usual. Jayk, condescension like that comes from an inverted sense of inadequacy. Peddle your personal problems elsewhere. Thermodynamics - I agree with you, but where I was coming from was that models are simply a representation of our understanding. The issue is that, as Lindzen says: "...the way current models handle factors such as clouds and water vapor is disturbingly arbitrary. In many instances the underlying physics is simply not known." Such models form the basis of the IPCC Summaries for Policymakers - you won't find any reference in there to such a "lack of knowledge". Finally, Parsec - I agree with you wholeheartedly. Much more research is required, and more humility on the part of everyone involved in attempting to model such a massively complex open system as Earth's climate. Aw, toyo, you hurt my feelings. Just as much as that PR flak Lindzen that you are so enamored with. I'm sure the cancer that is eating away at his addled brain is worried about the fact that Lindzen feels no personal responsibility for causing it with his smoking. Until such time as his brain is removed and his cancer soaked husk is rotting in the ground, I'll just have to pay my homage to his greatness, right? But once again, you and dachy prove that quantifiable vs. qualifiable isn't well understood so you just play dumb, your best acting parts yet.